The Capitol’s Main Rotunda was the setting for the senator’s annual gathering of public agencies and private organizations dedicated to helping people with disabilities. 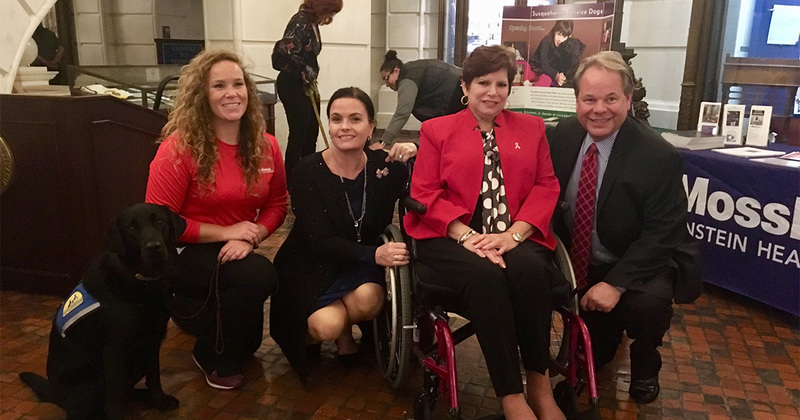 HARRISBURG, PA, October 3, 2018 – The Pennsylvania Capitol became a one-stop resource for people living with physical and cognitive disabilities today as a multitude of public and private providers gathered in the Main Rotunda for State Sen. Christine Tartaglione’s annual Disability Awareness Day. Exhibitors shared information about assistive services and technologies to help the senator kick off National Disability Employment Awareness Month. Hundreds of Capitol visitors and passers-by stopped to chat with exhibitors such as the PA Office of Vocational Rehabilitation, PA Assistive Technology, the Institute on Disabilities at Temple University, AgrAbility PA, Einstein/Moss Rehab, Living Well Your Way, the Center for Independent Living of Central PA, United Cerebral Palsy and Uniquesource. They also met a couple of the beautiful life partners from Susquehanna Service Dogs. These agencies and organizations offer tools and programs that help disabled people maximize their potential in the workforce and in their communities. Disability Awareness Day occurred one day after the Senate unanimously passed Tartaglione’s resolution to recognize October as National Disability Employment Awareness Month in the Commonwealth. The observance calls attention to disability employment issues and celebrates the contributions of workers with disabilities. This year’s theme is America’s Workforce: Empowering All. Senator Tartaglione has long been a leading advocate in Pennsylvania for people with disabilities. She was instrumental in creating the state’s Office for People with Disabilities, which serves as a go-to source for information about the many state and county agencies that offer services for people who need assistance in their daily lives.